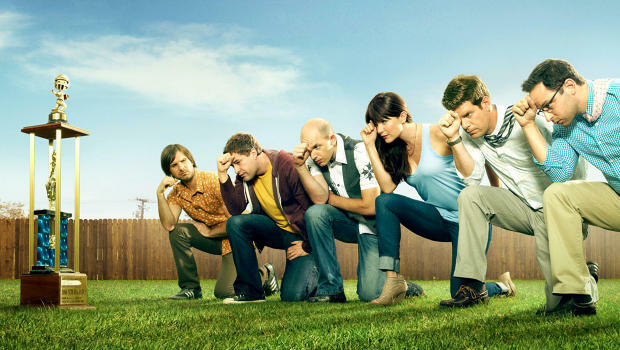 The End Is In Sight For ‘The League’!!! ‘The League‘ is a comedy about a group of friends and their loyalty to a fantasy football league. When the series began in 2009, I doubt anyone would have predicted that it would still be on the air six seasons later. It’s still on, but not for too much longer. If that news just bummed you out, I have some news that might cheer you back up, a 13-episode season seven has been renewed! The downside of that news is season seven will be it’s last. ‘The League‘ is the product of the husband and wife team of Jeff Schaffer and Jackie Marcus Schaffer who executive produce and direct for FX Productions. “Whatever, I’ve won it twice,” said Jackie Schaffer. “Most players in the NFL don’t make it seven seasons, and most TV shows even less so. We want to thank FX Networks and all our Eskimo brothers and sisters. NFL teams would be lucky to have fans as diehard as ours.” Added Jeff , “Spoiler alert: We already know how it will all end — with credits and the theme song.” The series began wobbly but gained momentum over the years and a fan base to match it’s growth. I could never quite get into it, I wanted to, but it didn’t happen. Maybe I’ll try it again one day, marathon-style. ‘It’s Always Sunny in Philadelphia’ and ‘The League’ Have Been Renewed!!! Seth Rogen and Evan Goldberg Now Have A TV Series At FX!!! The FX Network Will Launch a New Network Called FXX!!! ‘American Horror Story: Cult’ Has A Trailer Now – Check It Out!!! This entry was posted on Wednesday, December 10th, 2014 at 4:21 am	and is filed under News, Television. You can follow any responses to this entry through the RSS 2.0 feed. You can skip to the end and leave a response. Pinging is currently not allowed. « Jamie Lee Curtis & Emma Roberts Starring In ‘Scream Queens’!! !